I’m not talking about those little white untruths, the glossing over of things that most of us do from time-to-time in order to save feelings or avoid engaging in discussions that we know will circle endlessly around on themselves. I’m talking about deception for deception’s sake- that primary tool in the arsenals of the majority of those who are seeking leadership roles. The false narratives being created to drive soundbites and ad campaigns are repugnant to a shameful degree. I voted last week- one of more than 3.6 million Canadians who took advantage of the advance polls over the long weekend. Some of us- 71% more of us than voted in advance polling for the 2011 federal election- were likely weary of this never-ending campaign- running, as it did, throughout the summer- but I know that I did so in order to legitimately be able to tune out the fabrications and falsehoods that seemed to increase with each passing day. Done with that. My die is cast. I can only hope that others see past the prevaricating and patronizingly paternal posturing of the past few months (and past decade, for that matter) and chose progressive change. Thinking about the false narratives our leaders insist on feeding us gave rise to some personal reflection, and I realized, that while I’m not running for public office, and therefore not beholden to a reasonable degree of personal scrutiny, I’m not sure I have the moral high ground to be calling out kettles of any particular hue. I’m sort of a fraud, myself. Since I was off work this past week- taking some time to ‘catch up’ on stuff that too often falls by the wayside in the regular day-to-day of it all- I’ve been trying to focus on getting some writing done. Working on narratives that haven’t seen much action, of late, and feeling a little like a neglectful parent as I’ve done so. We all have stories, and we all choose to communicate those stories in different ways. I’ve always had an inclination for the written word, so the stories that fill my head most often take the form of fictional narratives. Around these parts, I tend toward the ‘essay’ or ‘opinion piece’, and I logged my fair share of hours researching and writing non-fiction, in the form of academic papers and that one big book that languishes on the shelf behind me, but my main hankering is for making up stuff- people and places and things that happen. Even in the non-fiction, though, my voice comes through clearly, I think. When I started this blog, as a newbie- looking for a way to write about things that move me (myths, religion, music, social justice- you know, all that stuff you’ll find if you pop around the past posts)- I was a little daunted by the public nature of the forum. Since I’m a generation (or two) older than those who were born with iPhones clutched in tiny hands, I was suspicious of the potential exposure that might come with putting it all out there. I was, at the time (and currently- but that’s another story), looking for a new career- having left the academic world following a whole lot of soul searching and self-evaluation. I read all kinds of horror stories about people who were black-listed for opinions or photos shared, a moment’s lapse, the ‘publish’ button accidentally tapped… You know- lives changed in an instant by the judgmental, under-educated trolling types that thrive on the Interweb. Also, I had concerns about compromising any potential future academic roles (no use burning even hypothetical bridges) by spouting off about the state of post-secondary education, as I see the situation, and so I erred (if erring it was) on the side of anonymous caution. I made the decision to write pseudonymously. I thought that doing so would afford a measure of security, and offer the opportunity to write in a different voice. Cole Davidson is the name of the narrator of a fictional piece of something I’ve been working on for a very long time. Interestingly, although I never confirmed or denied one way or another, most of my return readers- many who have become friends over the years- assumed that I’m male, which, given the name, is, I guess, not surprising. Reading some of the earliest posts (and some of them make me cringe, so if you’re feeling curious, please tread lightly) I, at least, can see the struggle between first- and third- person, vying for the post of narrator. Telling my own stories, but doing so as if I’ve told them to someone else who is now recounting them… yeah. That got old fast. Though perhaps not fast enough. I quickly discovered that this blog had the potential to be an on-going conversation– and the discussions that I’ve had here never cease to amaze me. In order to fully engage in this dialectic, I let go of all traces- save the pseudonym- of the literary conceit that even possibly prevented me from speaking authentically as myself. A little while ago, one of my former students sent me a PM commenting on one of my posts (since they are linked to my Facebook, LinkedIn and Twitter pages- I also have a Tumblr, but I’m rarely over that way, these days- posts are connected to my not-so-secret identity, as well), talking about what I’d written and asking why I assumed a male voice in communicating my ideas. Having listened to me over the course of a year of lectures and study groups, she was quite convinced that the voice was mine- and a little confused as to why I’d assume a male persona while writing about the stuff I used to teach about. She wasn’t critical- just curious. She is a great writer, and has adopted different voices herself, so was looking to chat about my experience doing so. I’ve been writing as Cole for long enough now, that I sometimes forget that’s it’s not ‘really’ me putting ‘myself’ out there. If he ever had his own voice (and I hope he still does- in the novel, at least), then he’s been over-shouted by mine, hereabouts. The fact that I don’t use my real name is the only fictive part of my existence here at colemining. It’s all me- so very much so that I long ago left behind all hopes of sorting out the character whose name I assumed, with all good intentions, in this particular outlet. Which means, that if the real Cole Davidson is to see the light of day (and I think he deserves to do so- especially since some usurper stole his identity more than two years ago), it will have to be in a different place- the one he was ‘born’, if you will, to inhabit. So I’m working on the fiction again. Stealing time (and who has enough of that, these days?) away from my peeps in this WordPress world, in order to spend some in one that I have created in its entirety (insofar as anyone ever creates anything whole-cloth. That world is recognizably similar to our own, after all). Divided loyalties, of a sort. But no one ever said that paying attention to all the voices in my head was supposed to be easy. Those of you who visit regularly, might have noticed that I posted a photo a few months back – and ‘outed’ myself, to a degree, at least. That I didn’t hesitate to do so is an indication that the dividing line between me and Cole has disappeared, assuming there ever was one. Going back over some older posts, I noticed that when I refer to myself it is often in an e e cummings-esque lower case sort of manner – although even that little editorial nuance isn’t terribly consistent. Cole fighting cole, for ascendancy or something Regardless, cole is not really Cole. And never has been. I’m starting to think, despite our seeming estrangement, we have become a little co-dependent. I did hang out with him a bit this week. I feel like we’re on the road to re-acquaintance, but it will take some more quality time to really renew a sense of one another and figure out what has changed since we last chatted. It’s been a long time. I think he’s changed – become more like me than I thought possible- but some of that will remain to be seen as we continue our discussions. Despite what some superstition-loving-deniers may think, we humans continue to evolve. And so, too, should our creations. From one way of looking at things, it shouldn’t matter who I am. If something I’ve said resonates, then groovy. Let’s chat about it. But, as I’ve said before, context matters. A lot. And identity is part of context. That doesn’t mean I’m unmasking completely. There are even more horror stories out there than when I started this thing. Atheist bloggers are targeted and murdered in parts of this world (not Toronto, admittedly, but still), and writers who speak against established norms lose livelihoods and freedoms under elites who seek to cling to power. I currently live in a country in which, I’m ashamed to say, scientists are muzzled and unfunded for speaking truths against the government’s agenda and policy-making machine. I’m not confident that civil disobedience and speaking out against social injustice won’t end up getting my name on a CSIS watch list. I’m hopeful that these things don’t come to full fruition- that the citizens of this nation will vote against politics of fear and division so we can regain our status in the eyes of the world- and, most importantly, live with ourselves. We’ll find out tomorrow. In between innings of the baseball game. I’ve set my current priorities, and the Jays are top of that heap at the moment. I’m loving the story they’re creating, this Blue October. I’ll re-engage with the political reality once it is actually realized. Demonstrating, once again, that we seem to share a brain, my lovely Glaswegian friend, Anne-Marie, posted about her decision to, once again, sign up for NaNoWriMo- that interesting social media phenomenon that is supposed to help writers get it together and crank up their word counts. I did that a couple of years ago. I think it was a good exercise, but here we are now, and the novel of that November is no closer to being finished. Not really. So rather than signing up, I think I’ll just commit to spending more time with that other Cole- and all his friends- as a way of focusing my writing for the next while. After I finish up an entry to the CBC Canada Writes short story contest, that is. While keeping things short isn’t really my forte (note the word count of this post, for example), if I’m going to diversify as a way of focusing, I might as well go all out. So I might be around even less, for a little bit (I know, I’ve hardly been here, lately, as it is). 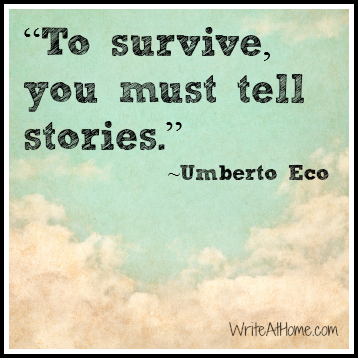 My drive to survive- and thrive- through the telling of some stories will be changing direction. I’ve gotten all fan-girl over Umberto Eco a number of times. He is an inspiration in so many ways. But as I looked for a pithy little saying/graphic to top this latest piece of something, I was torn by the number of quotes out there for the picking. Writers I admire, writers I just plain love. All those creators of stories that make the world a little better. There’s a difference between narratives that are fictional and those that are intentionally false. The latter are designed to influence the credulous and further the agendas of their creators, orators and those who are complicit in the perpetuation of the lies (no names mentioned certain Canadian media outlets…). The former, written with best intentions, add insights and truth to our on-going human dialogue. I’ve set the record straight, at least a little, regarding my own participation in this here narrative space. I go back to work tomorrow. I’m hoping that through the self-evaluation of this mini-break I’ve figured out a way to spend the day fulfilling my work responsibilities, while still retaining enough creative impetus to come home and spend time with Cole et al- for at least a space of time each evening. The elections results tomorrow will be a distraction (as will the debrief following the whole, sad business), and those Jays have a couple of weeks of baseball left to play (first two games in KC notwithstanding, As I keep reminding myself, there’s no crying in baseball, and we’ve come back from this type of deficit before), but, moving forward, I need to work at drowning out the irrelevant hindrances that serve to do no more than raise my blood pressure and existential ire. Whatever masks we might wear, as writers or as people, I really believe that our best stories come from places of sincerity and honesty. In them, we can find our best reasons for engaging with the world and our fellow humans. If we cut out all the white noise. So, a new beginning for me. Perhaps by moderating my propensity to preach to various choirs- both here and in my current day job- I can figure out a way to tell the stories I’ve been wanting to tell for as long as I can remember. Which requires tapping into the voice of my namesake for a time, and seeing what he might have to say about it all if I give him (back) his narrative lead. There’s a quote (attributed to Charles Darwin but stemming, in all real likelihood from a synopsis of On the Origin of Species presented by some guy named Leon C. Megginson. Ah, misattribution. Hurts my historian-sensibilities) that goes something like this: It is not the strongest of the species that survives, nor the most intelligent, but the one most responsive to change. I think a change would do me good. “So what is this, exactly, that you’re doing here? Some sort of Anne-Rice-ish Interview kind of thing?” As I sat at my usual table in the café, she sneaked up behind me. Disconcerted that she’d been able to do so, I turned, and noticed that her ubiquitous menthol cigarette was absent. “Well that wasn’t at all defensive.” Marie-Luce laughed again. Despite the fact that I was, in fact, feeling somewhat defensive, I had to smile. There aren’t many things I love in this world of ours more than Emel’s laugh. “How’s about my story? You going to tell that one too? Do I get to be a character in this whatever-it-is that you’re writing?” She was playing me a little. The question was meant, certainly, to elicit answers I wasn’t ready to give, but there was something a wee bit yearning in her tone, as well. She has always had a streak of vanity, well-hidden and oft-denied though it may be. “Surely you remember what happened the last time you did that? How one piece of writing altered everything. Are you willing to risk that level of change again?” Her slight pause was both reflective and exposed something of her own on-going struggle to make sense of all this. “Not that I’m trying to stop you. Never think that. But have you really taken on board just what you might be doing here? You know I love you, Coley. Surely you’ve had enough of transformation and revelation to last at least a lifetime or two?” She smiled, knowingly, but with that minor-chord note of sympathy that featured in most of our exchanges. Distracted by her smile (one of the other things I love most in this world of ours) I hesitated, thinking about her words for a minute. She was right. No doubt about that. The last time my desire for change – and the searching for answers that is, really, the keystone of my personality – led me to pick up a pen, the consequences were as irrevocable as they were shattering. If something needs saying? If change needs a kick-in-the-pants to get the stones rolling? I’m your guy. And, whether you know it or not, I’ve always been your guy. Since my best intentions were derailed by the idiocy surrounding the engineer of the anti-gravy train yesterday, today I’m all about the shiny and happy and moving forward with something that, while continuing to stray from the ‘mandate’ of this here colemining, at least demonstrates the vital importance of story in my life. Under other circumstances the combination of fire and ice would have to be described as transcendentally beautiful. 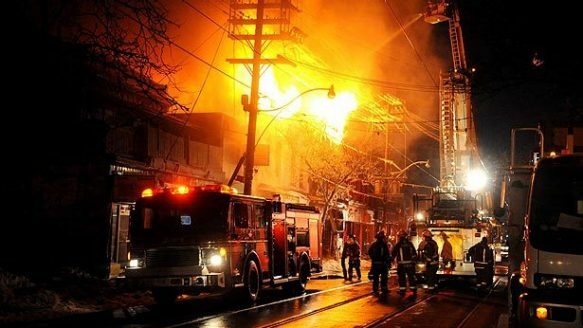 The flames licked the sides of the old buildings, and as painful as that was- especially for me, in love with things of age and grace- the water from the fire hoses freezing as it did into modern sculpture almost as quickly as it was expelled into the frigid February morning, had a grace of its own. Interesting. Twice in one sentence I use the word ‘grace’, and yet have no illusions that such a thing exists. Not knowing what I know, for as long as I have known it. The glow illuminated the face of the one I love best, and as I stared at him, I realized that I’ve seen that exact expression before, under circumstances that were too much the same, yet completely different. Time plays such tricks, when you have lived through as much of it as I have. Nearly two thousand years separated the first memory from the latest. Fire, no ice, but the same look of despair and resigned acceptance haunting the features of his face, making his great beauty even more profound and seemingly fragile. Burning, in the name of gods and politics- nothing more or less than ideologies and ideologues- created by humans, for better or much, much worse. Same tune, different lyric. History repeating itself to the degree that it was practically foregone as a conclusion. Clichéd almost. That first time, how many years had we passed together, only to separate for a time and be reunited in that great city? We were never long apart, yet that time marked the greatest estrangement, the most significant, and to be standing with him as the conflagration grew, as chaos reigned- although not to the sound of fiddle music as tradition and myth would have it- I remember being happy beyond expressing that I was with him again, yet unable to help being affected by the tragedy unfolding before us. He has always had that effect on me- to the point where I often can’t tell where my own feelings end and his begin. Such is the greatness of his empathy that it is so often projected onto to those closest to him. Whether he is aware of this power, I have never been sure. Then, as now, the depth of sadness threatened to undo me. In one weaker- for all my human failings, the passage and lessons of time have brought a type of strength, at least- it would have overwhelmed, and the night’s madness would have claimed another victim. But we stood apart from the crowd, on the rooftop of his apartment, watching from a distance, as we had in Rome. To move forward, begin yet again- these were my thoughts as I focused on the activity below. We loved this city, this country, with its polite, tolerant people, beautiful landscapes and varied- if punishing at times- seasons. But cities come and go. There are other places that offer the promise of permanence, if not its realization. New cities suggested opportunity and the chance at new lives. While his eyes remained dry, as always they betrayed pain that endured millennia, but for the first time I saw true despair and something even bleaker. For the first time in our enduring friendship I wondered if he would survive this latest blow. And since a world without him was unthinkable, I felt the first stirrings of my own mortality in years beyond counting. Yes. The story is set in Toronto. I LOVE this town. Lying, crack-smoking, ignorant mayors notwithstanding.